The first and the third step of the podium fot Dulong ! 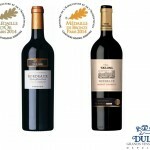 Our Premium Merlot-Cabernet 2013 won the most prestigious award, while our Classic Merlot-Cabernet 2013 won the bronze medal ! This is a great news for all the Dulong team !